“There’s storm is coming, Mr. Wayne.” warns Selina Kyle. But this looks looks like the kind of storm that Mr. Wayne, being an avid Lamborghini fan, would appreciate. Lamborghini has announced that the successor to the much loved, and record selling, Gallardo will be called the Huracán and here are all the details straight from Lamborghini’s headquarters in Sant’Agata Bolognese. As for those details, there are many. The Huracán is an entirely new design from the ground up. 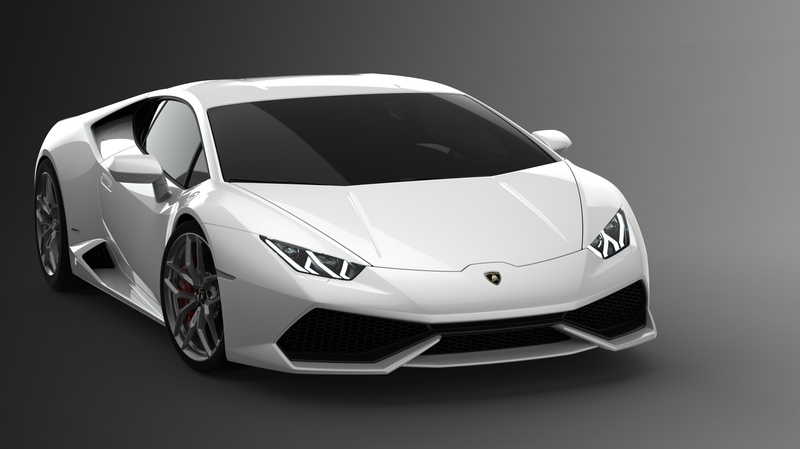 Taking many cues from the larger Aventador, the renderings of the Huracán are sharp and aggressive. Up front, the headlights are reminiscent of it’s big brother, only with a dual LED design. Lamborghini notes that their newest car will use LED technology for all lighting functions. Rearward, the glass engine cover is surrounded by slatted vents, most likely to keep the mid-mounted V10 cool. Yes, the littlest Lambo will retain all 10 cylinders, this time utilized both direct and indirect injection. Making 610 horsepower and approximately 415 lb-ft of torque, we’re sure the new Huracán will move along just fine. One of the few companies that remains honest in its numbering, the Huracán wears LP610-4 badges meaning that those 610 raging bulls will get put to the pavement through all four wheels. Lamborghini claims a 0-60 time of 3.2 seconds and a top speed of over 325kph (202mph for us American). Lamborghini has, brilliantly, introduced a start-stop technology. This obviously allows you and your jealous onlookers to enjoy the roar of the V10’s firing sequence as you motor about town. Inside an all-new 12.3 inch instrument panel is utilized. 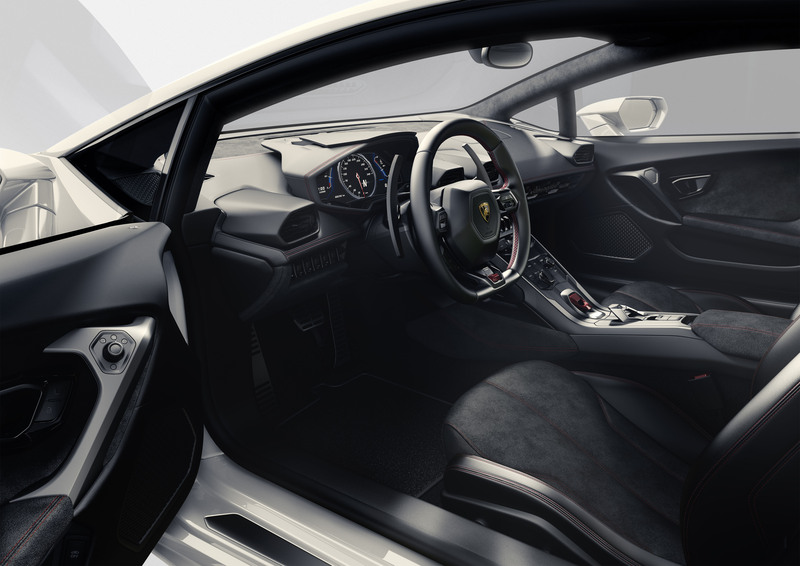 Lamborghini doesn’t get specific, but it’s probably similar to the Aventador’s center gauge cluster. Offering a full level of customization from navigation to tachometer, the center cluster will be driver focused. The rest of the interior is a mixture of leather and alcantara. As if you expected anything less than the raciest of materials backed by the hand-build Lamborghini craftsmanship. The Huracán is build upon a new chassis constructed of carbon fiber and aluminum. Our guess is that it will be much like Audi’s space frame. The chassis cradles the new 5.2L V10 engine behind the occupants, but in front of the rear axle. Amidst all that innovation, the biggest news may in fact be the transmission. For the first time ever, Lamborghini will utilize a new seven speed dual-clutch unit. They’ve also developed a new dynamic steering system allows for adjustable setups. As with the Aventador, the driver will have three different driving modes to choose from; Strada, Sport, and Corsa. Lamborghini says that these settings will influence mapping of the engine, transmission, all-wheel-drive system, dampers, stability control, and sound. Also, for a first time on the baby Lamborghini, carbon ceramic brakes are standard equipment. If you’re thinking about ordering one, you best get your order placed early. Lamborghini is planning on delivery to the first customers in the spring. Don’t fret if you aren’t one of the first. If the Huracán is anything like the Gallardo, you can expect a number of special editions. If you want to see one before you buy, Lamborghini is holding private preview events in over 60 cities worldwide. The Huracán will make it’s auto show debut in Geneva next year.